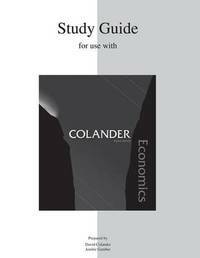 Written by David Colander and Jenifer Gamber, the 8th Edition Study Guide is designed for courses that emphasize basic knowledge of text material. A preface helps students prepare effectively for exams using the text, lecture notes, and the study guide. For each text chapter, this comprehensive learning resource includes Chapter at a Glance, Matching Terms and Concepts, Problems and Exercises, and Short Answer and Multiple Choice Questions with Answers to reinforce both text content and classroom lectures. Five pre-tests test knowledge of groups of related chapters.